1. Very clean and spacious and the staff were wonderful. 2. Well done on the information about the island upon checking in and where to visit. We were also escorted to our room and well briefed about the amenities included. 4. Breakfast was wonderful, simple yet sufficient. 3. They allowed us to store our bags at reception upon check out as we had a late flight. I was there April 1st. 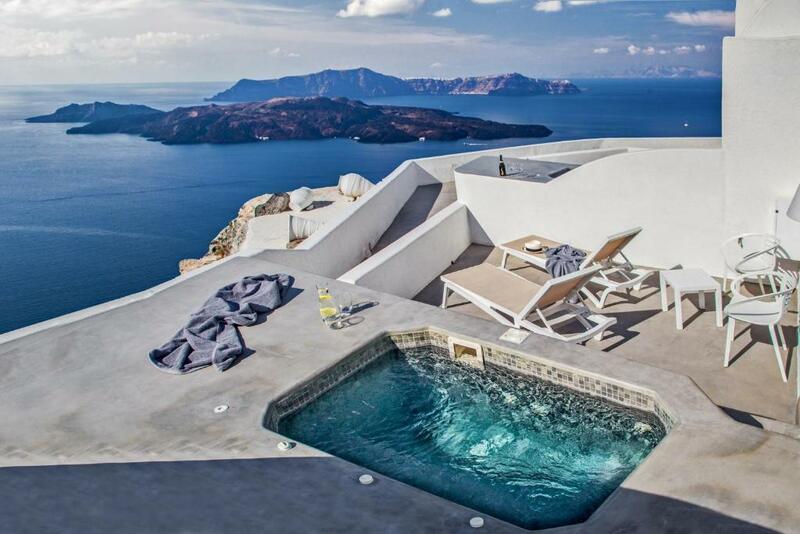 The view in this Villa is like no other. Breakfast is served every morning fresh and delicious. The people working here are so welcoming it makes you feel like you’re home. I give Villa Irini a totally 100 stars. Thank you for giving us champagne for our anniversary evern ordering food for us at 11:00PM. You guys are the best. Will definitely go back here a million times. The BEST thing about this amazing hotel was the view!! OMG the view❤️ but I have to say i loved everything, the staff was really amazing, breakfast super, the room perfect. It was way overpriced. It was not worth it at all!! This villa was the best place we have ever stayed!!! Eveything was magical, the room, the location, the lovely staff and ofcourse the breakfast and view! 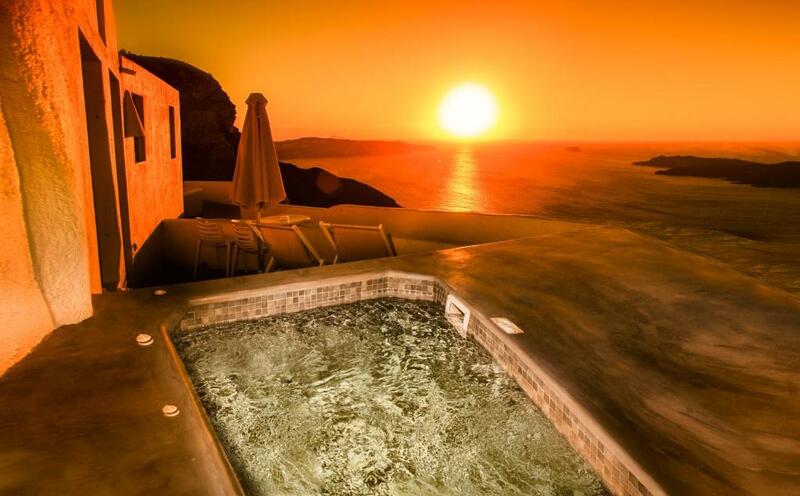 We had the best stay in Santorini, and the sunset from our room was so magical!! The staff is great!! The locations is perfect! Best sunset on the island!!! Bus station is near! The room are superb and the hottub is awsome!!!!! Nicholas and Andrew were fantastic! They worked extra hard to make our stay wonderful. Of course the caldera view and private hot tub overlooking the sea are to die for, but importantly the staff (Nickolas, Andrew, the chef) made our stay extra special. I would highly recommend this site to anyone!! 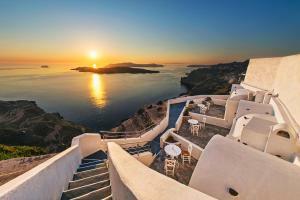 For kindness, service, and a relaxing stay, there is no better place in Santorini! Exceptional staff! Nickolas and Andrew were amazing-always cheery, very helpful, eager to make your stay perfect! The view was spectacular. The chef makes a great risotto. We had a wonderful 6 day stay. Highly recommend!! 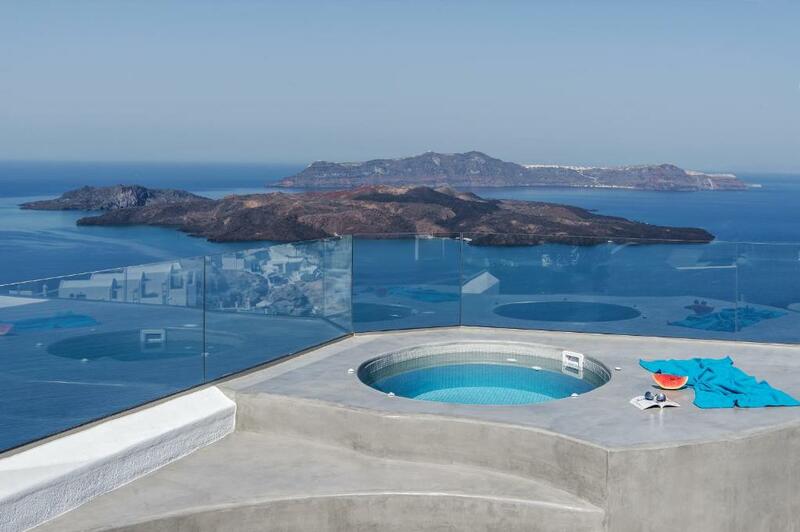 Lock in a great price for Villa Irini Fira - Adults Only – rated 9.4 by recent guests! One of our top picks in Fira.Perched on Caldera cliffs, the Cycladic-style Villa Irini features an outdoor pool and a furnished sun terrace overlooking the Aegean Sea and the Volcano. It offers elegantly decorated units with terrace and provides free WiFi in public areas. The center of Fira Town is 1.6 mi away. 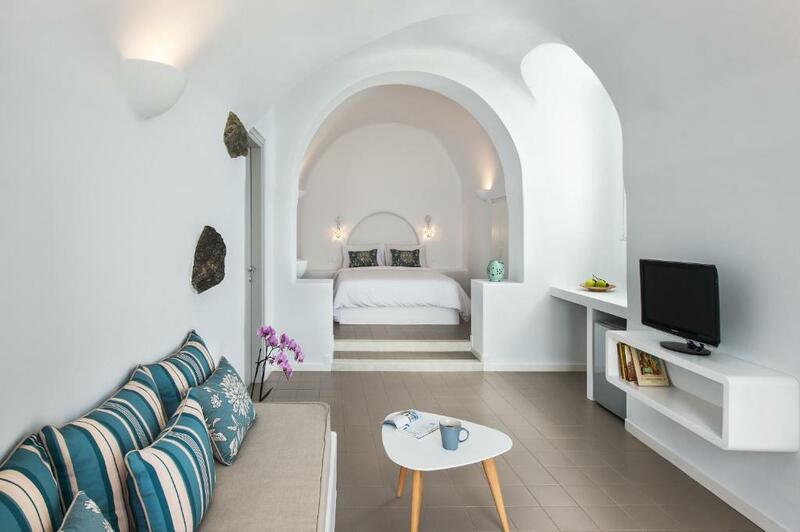 Fitted with built-in beds, white wooden furnishings and soft colors, the rooms and suites of Irini enjoy views over the Aegean Sea and the Volcano. Each unit is equipped with air conditioning, safe, flat-screen satellite TV and a fridge. The modern bathrooms come with bath or shower, hairdryer and free toiletries. Breakfast items are daily renewed in the units. Maid service is offered every day, and free beach towels are available for all guests. Fira Town with an array of restaurants, shops and bars is 1.2 mi away, while a bus stop is just 150 feet away. Ormos Athinios Port is 2.8 mi from the property and Santorini Airport is at a distance of 3.7 mi. The Archaeological Museum of Thera lies within 0.9 mi away. 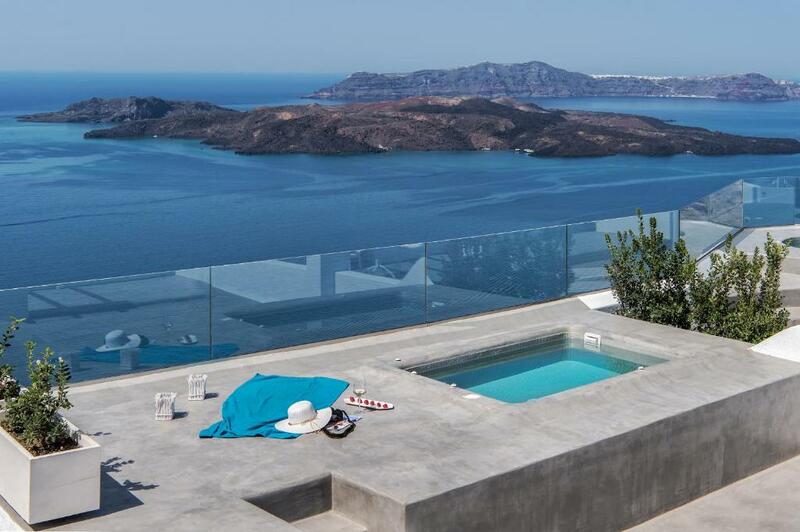 When would you like to stay at Villa Irini Fira - Adults Only? Split-level, elegantly decorated suite with a separate seating area and a terrace overlooking the Aegean Sea and the Volcano. It is equipped with air conditioning, a safe, a flat-screen satellite TV and a fridge. The modern bathrooms come with bath or shower, hairdryer and free toiletries. Breakfast items are available. Elegantly decorated, air-conditioned room with a terrace overlooking the Aegean Sea and the Volcano and an outdoor hot tub. It is equipped with a safe, a flat-screen satellite TV and a fridge. The modern bathrooms come with bath or shower, hairdryer and free toiletries. Breakfast items are available. Spacious, elegantly decorated room with seating area and a terrace overlooking the Aegean Sea and the Volcano and an outdoor hot tub. It is equipped with air conditioning, a safe, a flat-screen satellite TV and a fridge. The modern bathrooms come with bath or shower, hairdryer and free toiletries. Breakfast items are available. 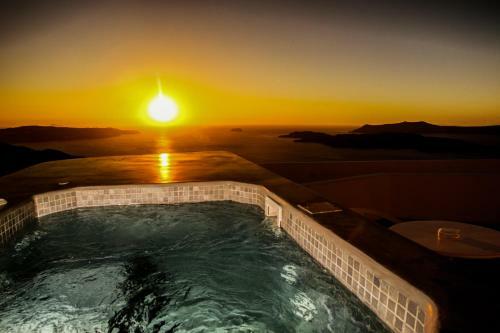 Located on the rim of the Caldera with beautiful unobstructed view to the Volcano and the famous sunset with friendly service in an exclusive accommodation. House Rules Villa Irini Fira - Adults Only takes special requests – add in the next step! Villa Irini Fira - Adults Only accepts these cards and reserves the right to temporarily hold an amount prior to arrival. Please note that the credit card used for the reservation must be presented upon arrival by the owner (photocopies and photographs of the card are not accepted). In case the credit card is not presented upon check-in, property will charge another card on the spot and refund the originally provided card with the equivalent amount. Please note that virtual cards are not accepted. The receptionist was extremely cooperative and helpful. Overall the room was nice with good view. the hot tub was not private in fact it was in an open area. The inside of the suite is a bit humid at night but I guess this is because it is located in a traditional cave directly in the rock. Perfect stay : breathtaking view from the suite, beautiful accommodation and facilites, private heated jacuzzi, very welcoming and helpful staff, delicious breakfast. About 30 minutes by walk from the center of Fira : perfect because very quiet, not too crowded. 1. The bathroom was not practical! Bathroom shaped like a large tub but no stopper to fill and no shower head only bath hoes. 2. We had our own space, but outdoor was not private. Guests using the pool can see in as there are no partitions or dividers also the neighbouring room. 3. Towels and robes felt old and hard. The room was lovely and having the hot tub on the balcony was perfect. Breakfast was fantastic. Service was unbelievable and views were fantastic! Everything was beyond my expectactions. Very comfortable hotel, excellent breakfast, very friendly staff, good location, and of course, you get to see that brilliant 'Santorini' sunset from the private space outside your room. All of the staff were so kind and generous with their time. They even set up a breakfast really early on our last day and sent it to our room. And they included some sandwiches for the road. Upon welcoming us, they provided presecco and were there to help with recommendations and anything we needed. Thank you! I was with my mom and brother, so location was really not good, is a perfect place to go with your husband or partner. Absolutely nothing...keep it up it exceeded all my expectations!!! Everything!!! Excellent view, room, food and in particular all the staff...cleaning staff, concierge, breakfast chef and waiter...loved every moment of the stay and will most definitely be back!!! We liked everything. They take care of their guests. What was described was not what I seen or expected . Perhaps that’s why there are no pictures of the rooms. It’s literally a room and the shower is horrible. 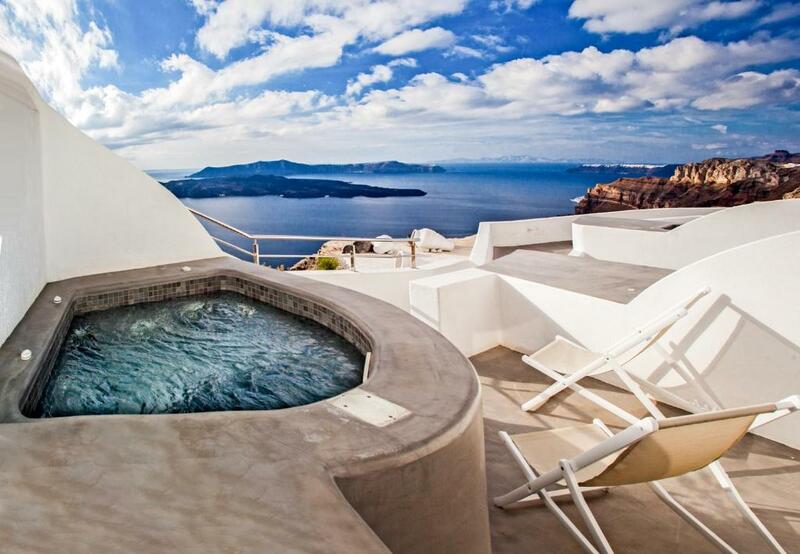 The place gives you a jacuzzi caldera view without walking up or down any stairs. The room has two floors and gives the cave house feel, breakfast is great cooked individually and served personally. There are good eating places within walking distance and very near to winery. The outdoor jaccuzzi was not operating properly (would not heat sufficiently) and this could (should) have been checked and fixed prior to our arrival. The views, and private nature of our room where the reasons we booked and we were not disappointed.